Our radiographic facilities enable us to x-ray your pet on the premises and process the films in our automatic processors within 3 minutes. We have a modern digital system, dental radiography and the facility to take a portable digital model out on the road for horses. Radiographs give us information on conditions affecting the bones of the body but can give important information on soft tissue diseases too. We have both large and small endoscopes, which allow visual examination of the respiratory or gastrointestinal tract of the body. Whilst in horses, endoscopy can be performed on a conscious or sedated animal, a general anaesthetic is required for cats and dogs. Ultrasonography can be utilised in the examination of the heart and for identifying size and structural changes in various internal organs. It also allows us to offer a safe and reliable technique for pregnancy diagnosis. 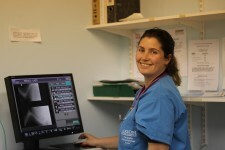 We have both large and small animal ultrasound facilities. Several of our clinicians have undertaken post graduate courses in order to update their skills in this field. Ultrasonography is used for fertility work in horses and farm animals and for assessing tendons in horses. High blood pressure, which is often seen in cats, particularly elderly ones can give rise to serious complications. Monitoring of blood pressures using our Doppler sphygmomanometer is readily undertaken at the practice following a consultation with one of our veterinary surgeons. An electrocardiogram (ECG) enables us to measure the electrical activity of your pet's heart to ensure that it is working effectively and correctly. We examine the trace recordings on site and if necessary can refer the trace to an external cardiologist. We have recently invested in state of the art biochemical and haematological analysers which enable us to run blood tests on your pet with rapid, accurate result and are now in a position to run many tests such as those for thyroid levels, fructosamine, coagulation screens and lungworm serology which we would previously have had to send to an external laboratory, thus reducing waiting times for results and eliminating previous problems with postal delays. We are fortunate that as a large practice we are able to invest in excellent diagnostic equipment to provide a great service for our clients. We undertake microscopy work which includes skin scrapes for parasite identification, identification of types of ear infection and urine sample analyses. We also have access to a network of specialized external laboratories which meet any needs that we are unable to provide. Quite aside from those of our vets who have a particular interest in ophthalmology, Maes Glas Vets now hosts a specialist ophthalmology clinic. A specialist veterinary ophthalmologist from the Eye Veterinary Clinic in Leominster visits us twice a month to review complex cases which have been referred from local practices.